How to make your own farm animals, equipment, and scenery with recycled cardboard. Tracey Radford is a master of taking everyday cardboard and turning it into incredible, yet simple, craft projects for parents and children to make together. 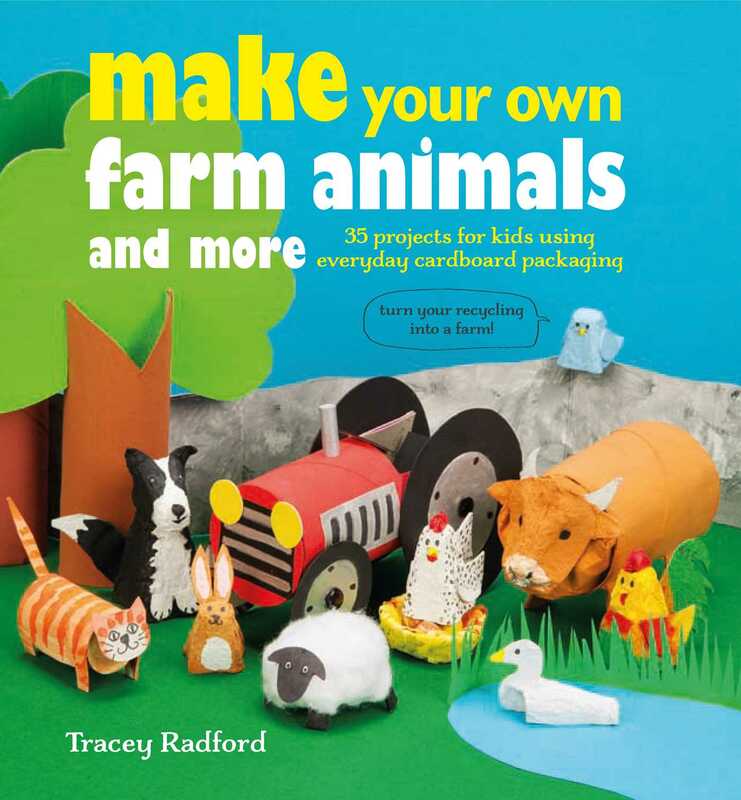 In Make Your Own Farm Animals she has created an amazing menagerie of creatures, as well a tractor, farmhouse, barn, hay bales, and much more. In Chapter 1, In the Field, there are adorable animals to make such as Clarissa the Cow, Hector the Horse, and Felix the Fox. In Chapter 2, Farmyard Fun, we get to create Paddy the Pig, Shep the Sheep Dog, and even Farmer Fred and his wife Winnie. In Chapter 3, Home Sweet Home, Tracey gives the animals shelter with her easy-to-build stable, piggery, and kennel. Finally in Chapter 4, Machinery and Scenery, there’s plenty of pretty farm scenery to make, such as a pond, trees, grass, and flowers, as well as that all-important farm equipment. Every project is made using simple step-by-step instructions, with handy tips throughout. Parents will delight in creating this wonderful farm with their children and never look at a cardboard tube or empty egg carton in the same way again! A love of craft has always weaved in and out of Tracey Radford’s life: throughout her childhood in Northern Ireland, her career as a BBC journalist and now, as a busy mum of three. When her husband was posted to Afghanistan for a year in 2011, she started writing a blog to let off steam. It quickly became a space to explore and share new craft ideas. A keen recycler and upcycler, the crafting house rule is: ‘only what’s to hand is allowed’, which usually means whatever’s in the recycling pile! Tracey started making cardboard animals with her daughter, and that’s how their zoo adventure began. Their clever creatures are now a hugely popular part of her blog. Visit Tracey’s blog at patchworkparent.blogspot.co.uk. Tracey is based in Gloucestershire, UK.